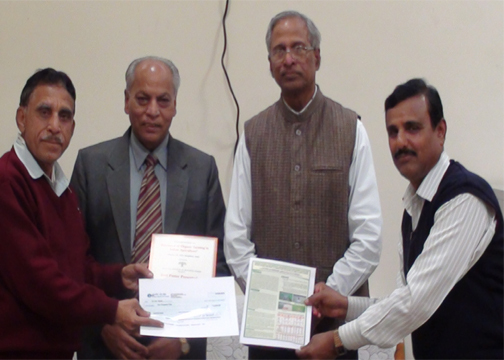 Dr. Yogendra Singh, Assistant Professor (Biotechnology) has awarded with “Scientist of The Year Award-2017” awarded by Agriculture Technology Development Society , Ghaziabad (U.P) in International Conference on “Advances in Agriculture and Biodiversity Conservation for Sustainable Development” held at C.C.S University, Meerut(U.P), India during 27-28 October 2017. Millennium ICRISAT Science Award 2008 for contribution in chickpea research towards adoption of improved chickpea cultivars in Southern India, Myanmar and Ethiopia. ICAR awarded for Outstanding Interdisciplinary Team Research for Soybean Improvement on 16th July, 2010 at the occasion of Foundation day of ICAR. JNKVV Jabalpur has been awarded as Best Research Centre of All India Coordinated Research Project on Forage Crops in kharif workshop held on 10-11 May 2013 at Assam Agricultural University, Jorhat. 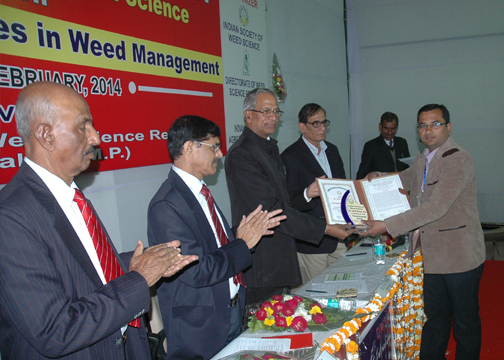 The Award was conferred Dr. R. P. Dua, Assistant Director General (Food & Forage Crops), ICAR, New Delhi. Dr. A. K. Mehta and Dr. S. K. Bilaiyya, Principal Scientist (Agronomy) College of Agriculture, Jabalpur has collected the award & citation. Best Poster Presentation Award 2014: Dr. V. K. Shukla, Principal Scientist and Dr. Sharad K. Vishwakarma, Technical Assistant, Department of Agronomy, JNKVV Jabalpur received the best poster presentation award in the National Seminar on “Relevance of Organic Farming in Indian Agriculture” organized by National Institute of Advanced Studies, Bangalore from February 3-4, 2014, at Bangalore (India). 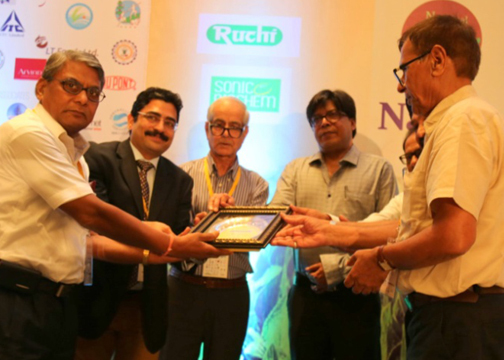 Best Breeder Seed Production Centre Award 2014: The Directorate of Seed Research of Indian Council of Agricultural Research (ICAR), New Delhi has first time initiated the “Excellence Breeder Seed production Unit Award” based on five years seed production of the centre on National level. Jawaharlal Nehru Krishi Vishwa Vidyalaya has been conferred with “Certificate of Excellence” for Best Breeder Seed Production Centre of AICRP-NSP (Crops) for the year 2013-14 in the National Workshop held on Sri Nagar (J&K) during 24-27th April 2014. ISWS Young Scientist Award 2014: Dr. A.K. Jha, Agronomist received the ISWS Young Scientist Award 2014 by Indian Society of Weed Science at Biennial Conference held at DSWR Jabalpur during 15-17 February 2014. The Directorate of Seed Research of Indian Council of Agricultural Research (ICAR), New Delhi has first time initiated the “Excellence Breeder Seed production Unit Award” based on five years seed production of the centre on National level. Jawaharlal Nehru Krishi Vishwa Vidyalaya has been conferred with “Certificate of Excellence” for best Breeder Seed Production Centre of AICRP-NSP (Crops) for the year 2013-14in the National Workshop held on Sri Nagar (J&K) during 24-27th April 2014. Recognition to Scientist: Dr. A. N. Shrivastava, Principal Scientist (Soybean), Jawaharlal Nehru Krishi Vishwa Vidyalaya, Jabalpur, honored on 10th June, 2015 at the occasion of “National Conference on Sustainable Soybean, Bhopal organized by Solidaridad, South and South East Asia for his commendable breeding research work in the development of mega varieties of soybean covering more than 85 % area of the country, in the presence of Dr. Rajesh Rajora, Principal Secretary, Department of Farmer Welfare and Agriculture, Govt. of MP, Dr. Akhilesh Saraf, Director of Ruchi Group of Industries, Dr. Shatadru, Managing Director, Solidaridad, South and South East Asia, Dr. V. S. Bhatia, Director, Directorate of Soybean Research, Indore.